Intervention intéressante ! Merci chambre noire ! In one of the deleted scenes on the Pulp Fiction DVD, Mia Wallace explains to Vincent Vega that "there’s only two kinds of people in the world: Beatles people and Elvis people. Now Beatles people can like Elvis and Elvis people can like The Beatles, but nobody likes them both equally. Somewhere you have to make a choice." Personally, I adore The Beatles and consider them to be among the most brilliant artists of the 20th century (who doesn’t? ), yet Elvis still one-ups them for one simple reason: He’s Elvis! You can’t beat that. Elvis Presley’s body of work might be uneven and he became rather grotesque in his latter years, but I can’t look at archival footage of him from the beginning of his career, in the mid-1950s, to what was arguably the pinnacle of his career, the ’68 Comeback Special, and call myself anything other than an Elvis person. There’s something infinitely fascinating about Presley during his prime, when he managed to convey both cocky charisma and good ol’ boy earnestness. He also happened to record countless great songs, which always put a smile on my face when I listen to them. Heck, I even have a soft spot for Elvis’ movies, dopey as they may be. As such, I was really looking forward to the homegrown exhibit From Elvis to The Beatles: The Birth of Rock’n'Roll in Quebec 1956-1964, and I wasn’t disappointed, even though it was still a work in progress when I checked it out, a couple of days ahead of the opening. For more than a year now, Patrice Caron has been working towards creating a rock and roll museum, not unlike the one in Cleveland, but specifically devoted to the way rock music has evolved right here in La Belle Province. His dream is now becoming a reality, as the first exhibition of the wandering Quebec Rock and Roll Museum is set to open in Montreal, before being taken on the road to places like Rouyn-Noranda and Quebec City. From Elvis to The Beatles takes us back to that golden moment in 1956 when, through early Elvis records such as Heartbreak Hotel, Don’t Be Cruel and Hound Dog, our province caught the rock fever, along with the rest of the known universe. Now we all know that Elvis didn’t actually invent rock and roll, but he’s the one that made it into such a phenomenon. 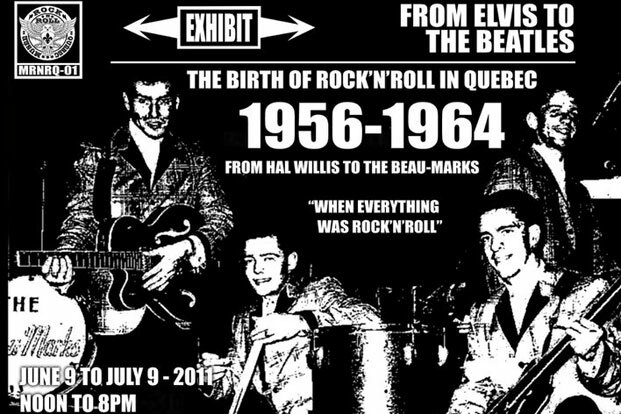 After establishing how Elvis contributed to getting the ball (rock and) rolling, the exhibit moves on to telling the extraordinary stories of local artists who, in some cases, have sadly been forgotten: Hal Willis, a Normétal rockabilly singer who was hired by Colonel Parker and became the only Québécois to ever share a stage with Elvis; The Avalons, a local doo-wop group who benefited greatly from the fact that Montreal was among the first cities in North America to be racially integrated; Les Jérolas, a duo who made it all the way to The Ed Sullivan Show; Little Billy Mason from Verdun and his band The Rhythm Jesters, who were the first white act to perform at the Apollo Theatre, a year before Buddy Holly; The Beau Marks, whose hit single Clap Your Hands charted everywhere from Canada and the U.S. to Europe and even Australia; The Melody Makers, a NDG band started by brothers Danny and Roberto Orsini before they were even 10 years old; Les Jaguars, an instrumental group from Saguenay-Lac-Saint-Jean featuring Arthur Cossette, the original Québécois guitar hero, and many others. "The idea of giving these people their proper dues is long overdue," says Alex Taylor, who put together the exhibition along with Caron, Eric Ayotte, Félix Desfossés, Eric Bertrand and others. "I’ve pretty much been collecting this for the past 25 years, just as a hobby," Taylor continues. "Then Pat Caron came to me one day and said, ‘Wouldn’t it be great if we could celebrate the accomplishments of the rock and roll pioneers in Quebec?" And I said, ‘Okay, I’ve got plenty of stuff!’"
Taylor and other collectors lent all kinds of things to the museum, including old records, posters, fan magazines, newspaper clippings, autographed headshots, sheet music, costumes, musical instruments, phonographs, transistor radios, ticket stubs, and knick-knacks like drink stirrers from the Esquire Show Bar and matchbooks from Café St-Michel. Archival footage and home movies of the artists will be projected and, naturally, many hours’ worth of great music from Quebec’s rock and roll pioneers will be played while folks visit the exhibit. You owe it to yourself to pay a visit to the Quebec Rock and Roll Museum – whether you’re an Elvis person or a Beatles person. 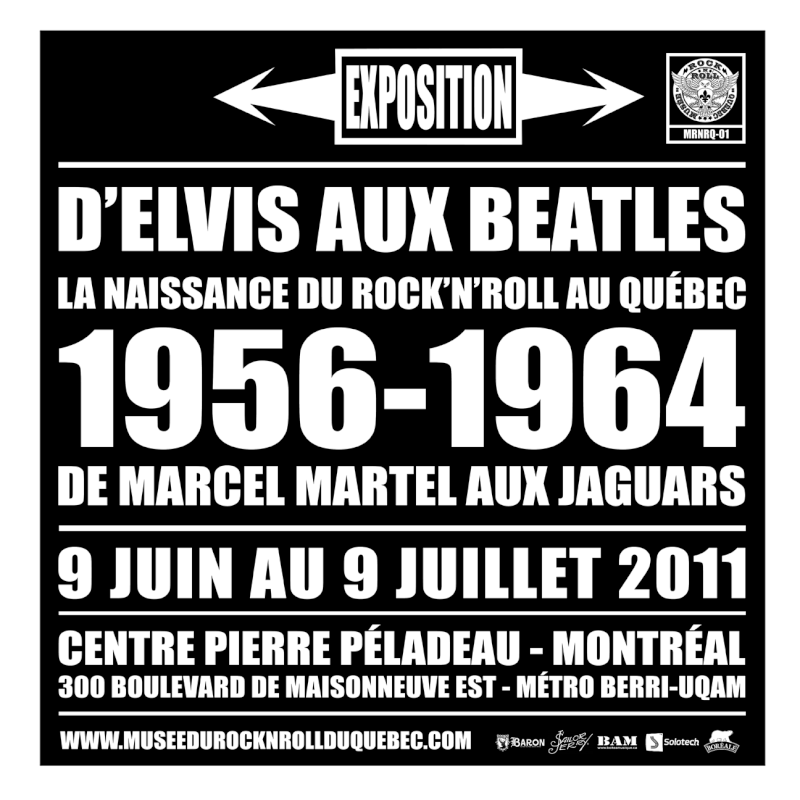 From Elvis to The Beatles: The Birth of Rock’n'Roll in Quebec 1956-1964, at Centre Pierre-Péladeau (300 Maisonneuve E.), June 9 to July 9. Gala des immortels (Hall of Fame induction ceremony) at Club Soda, June 19. And that choice tells you who you are ! Yep, sympa cette expo ! "Meursii bocou ! " Je suis en train de regarder le biopic d'Elvis de John Carpenter avec Kurt Russel..
Mais quelle merde, mais alors quelle merde!!! Si tu parle du téléfilm avec Jonathan Rhys Meyers et Randy Quaid dans le rôle du Colonel, il est intéressant aussi, mais loin d'être parfait, lui aussi, juste "plus moderne" ! Si on passait aux choses sérieuses ?